For the cultural description of hip, see Buttocks. The hip region is located lateral and anterior to the gluteal region, inferior to the iliac crest, and overlying the greater trochanter of the femur, or "thigh bone". In adults, three of the bones of the pelvis have fused into the hip bone or acetabulum which forms part of the hip region. The hip joint, scientifically referred to as the acetabulofemoral joint (art. 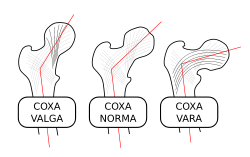 coxae), is the joint between the femur and acetabulum of the pelvis and its primary function is to support the weight of the body in both static (e.g. standing) and dynamic (e.g. walking or running) postures. The hip joints have very important roles in retaining balance, and for maintaining the pelvic inclination angle. Pain of the hip may be the result of numerous causes, including nervous, osteoarthritic, infectious, trauma-related, and genetic. The proximal femur is largely covered by muscles and, as a consequence, the greater trochanter is often the only palpable bony structure in the hip region. The transverse angle of the acetabular inlet (also called Sharp's angle and is generally the angle referred to by acetabular angle without further specification) can be determined by measuring the angle between a line passing from the superior to the inferior acetabular rim and the horizontal plane; an angle which normally measures 51° at birth and 40° in adults, and which affects the acetabular lateral coverage of the femoral head and several other parameters. 30° up to 4 months of age. 25° up to 2 years of age. The capsule attaches to the hip bone outside the acetabular lip which thus projects into the capsular space. On the femoral side, the distance between the head's cartilaginous rim and the capsular attachment at the base of the neck is constant, which leaves a wider extracapsular part of the neck at the back than at the front. The hip muscles act on three mutually perpendicular main axes, all of which pass through the center of the femoral head, resulting in three degrees of freedom and three pair of principal directions: Flexion and extension around a transverse axis (left-right); lateral rotation and medial rotation around a longitudinal axis (along the thigh); and abduction and adduction around a sagittal axis (forward-backward); and a combination of these movements (i.e. circumduction, a compound movement in which the leg describes the surface of an irregular cone). Some of the hip muscles also act on either the vertebral joints or the knee joint, that with their extensive areas of origin and/or insertion, different part of individual muscles participate in very different movements, and that the range of movement varies with the position of the hip joint. Additionally, the inferior and superior gemelli may be termed triceps coxae together with the obturator internus, and their function simply is to assist the latter muscle. A hip fracture is a break that occurs in the upper part of the femur. Symptoms may include pain around the hip particularly with movement and shortening of the leg. The hip joint can be replaced by a prosthesis in a hip replacement operation due to fractures or illnesses such as osteoarthritis. Hip pain can have multiple sources and can also be associated with lower back pain. X-ray of the hip, with measurements used in X-ray of hip dysplasia in adults. ^ "hip region". MediLexicon. Retrieved 2018-08-02. ^ Lequesne, M (2004). "The normal hip joint space: variations in width, shape, and architecture on 223 pelvic radiographs". Annals of the Rheumatic Diseases. 63 (9): 1145–1151. doi:10.1136/ard.2003.018424. ISSN 0003-4967. PMC 1755132. PMID 15308525. ^ Figure 2 in: Saikia KC, Bhuyan SK, Rongphar R (July 2008). "Anthropometric study of the hip joint in northeastern region population with computed tomography scan". Indian J Orthop. 42 (3): 260–6. doi:10.4103/0019-5413.39572. PMC 2739474. PMID 19753150. ^ a b Page 131 in: Whitehouse, Richard (2006). Imaging of the hip & bony pelvis: techniques and applications. Berlin: Springer. ISBN 978-3-540-20640-8. ^ a b  Chosa, E.; Tajima, N. (2003). "Anterior acetabular head index of the hip on false-profile views. New index of anterior acetabular cover". The Journal of Bone and Joint Surgery. British Volume. 85 (6): 826–829. PMID 12931799. ^ Page 309 in: Jeffrey D. Placzek, David A. Boyce (2016). Orthopaedic Physical Therapy Secrets - E-Book (3 ed.). Elsevier Health Sciences. ISBN 9780323286831. ^ Setia, Rahul; Gaillard, Frank. "Developmental dysplasia of the hip". Radiopaedia. Retrieved 2018-03-01. ^ Figure 2 in: Windhagen, H.; Thorey, F.; Kronewid, H.; Pressel, T.; Herold, D.; Stukenborg-Colsman, C. (2005). "The effect of functional splinting on mild dysplastic hips after walking onset". BMC Pediatrics. 5 (1): 17. doi:10.1186/1471-2431-5-17. PMC 1166563. PMID 15958160. ^ Page 217 in: Frederic Shapiro (2002). Pediatric Orthopedic Deformities. Elsevier. ISBN 9780080538563. ^ Frank Gaillard. "Acetabular angle". Radiopaedia. Retrieved 2018-03-01. ^ a b Page 942 in: Brian D. Coley (2013). Caffey's Pediatric Diagnostic Imaging (12 ed.). Elsevier Health Sciences. ISBN 9781455753604. ^ a b "Hip Fractures". OrthoInfo - AAOS. April 2009. Archived from the original on 29 June 2017. Retrieved 27 September 2017.